When an employee is injured at work, CompCorePro strives to achieve the best possible outcome. We efficiently review and handle the workers compensation claim so the employee can return to work faster and save your company money. Our cost-effective process enables our experienced clinicians to analyze claims, determine appropriate medical treatment, using our proprietary medical algorithms. The result? Success for your self-insured business. Our leading priority at CompCorePro is to effectively close claims and reduce workers compensation cost to the employer. The companies we serve have saved a significant amount of money, thanks to our team of clinical professionals and specialized medical algorithms. 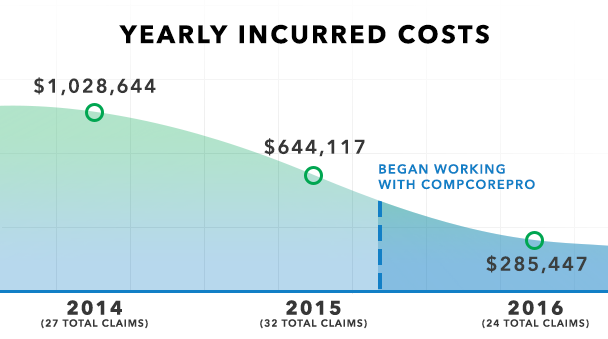 With the help of CompCorePro, one of our clients was able to bring the incurred costs down to $285,447 from 24 claims by 2016. 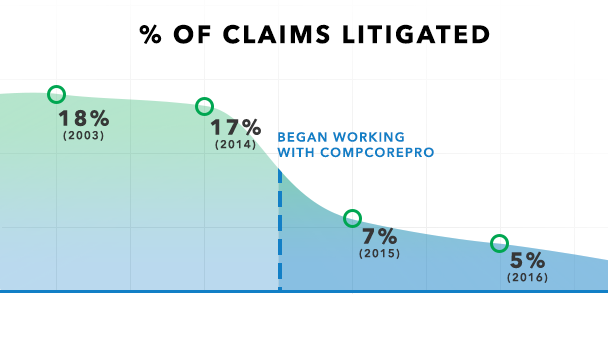 Another client was facing high rates of litigated claims.With CompCorePro on their side, only 7% of claims were litigated in 2015, and 5% were litigated in 2016. Our medical clinicians connect with workers compensation claims adjusters to save your company from overspending on medical expenses — decreasing your total incurred costs and number of litigated claims. Interested in how we can create success for you? Contact us at (708) 547-3555 for more information.